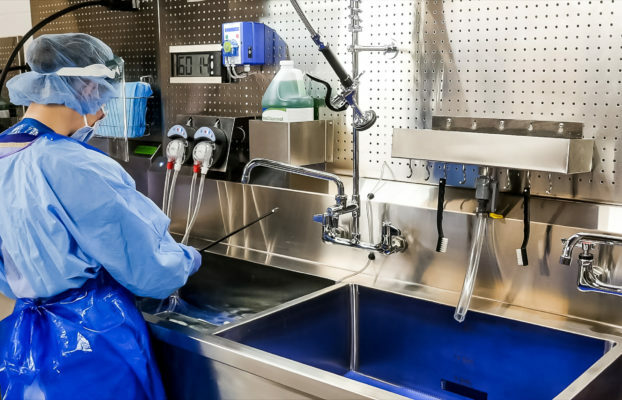 Engineered by sink experts who understand the reprocessing space, PureSteel Healthcare Reprocessing Sinks are the comprehensive stainless steel sink choice for reprocessing departments. 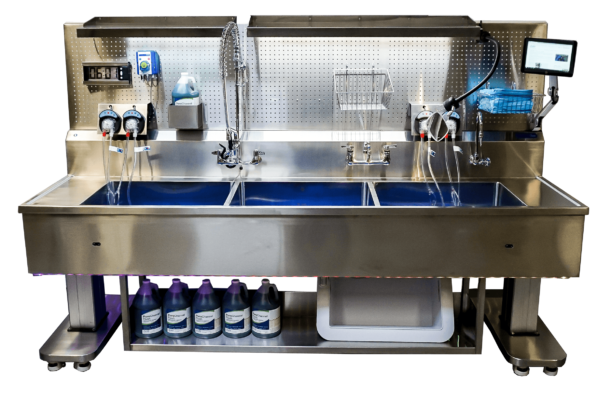 These high quality stainless steel sinks include an electronic push button height adjustment so that each technician or nurse can meet their ergonomic requirements. 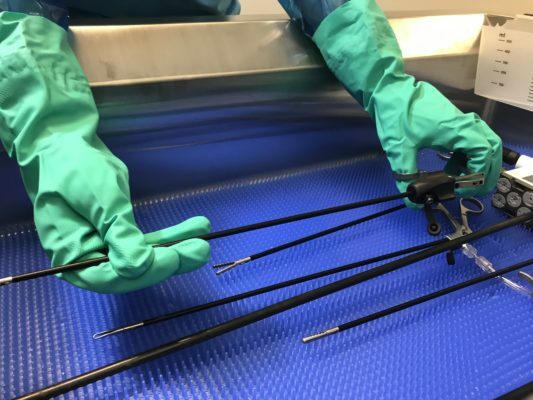 This feature prevents unnecessary back bending while protecting instruments from damage. An ergonomic wrist rest is also integrated to remove pinch points during reprocessing and reduce wrist strain and injury. The PureSteel sink’s posterior back wall panel also adjusts automatically as the sink height changes. 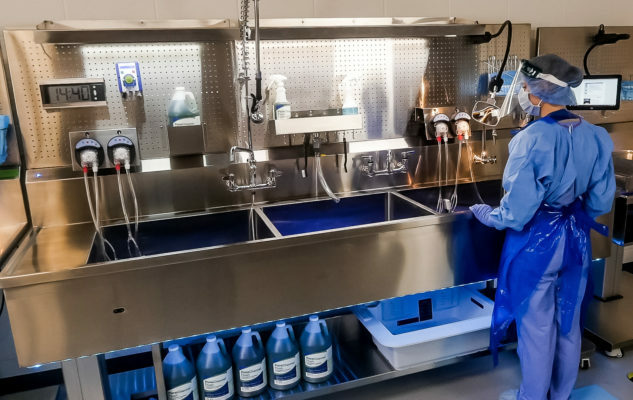 Pure Processing offers a variety of optional accessories that can be added to the back wall panel to clear counter space, organize tools near the user, and help make pre-cleaning more efficient. The integrate storage shelf has an open configuration, which prevents water damage under the sink and helps ensure a long, useful life. 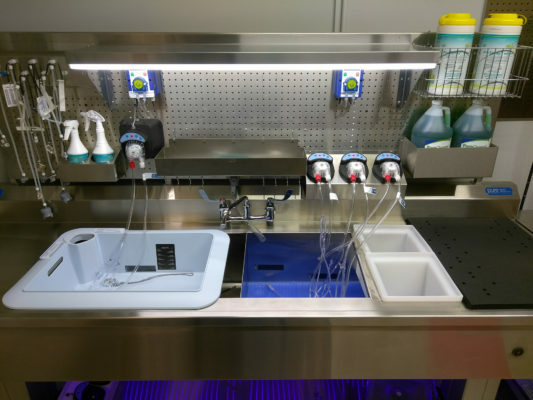 The storage shelf can also be height-adjustable, raising and lowering to remove the lift and strain from heavy gallon bottles, while also allowing easy mopping underneath the sink. 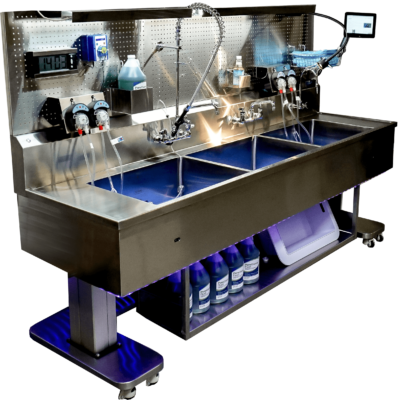 PureSteel Healthcare Reprocessing Sinks come in standard or custom sizes, and can be fixed or height-adjustable.